Preheat the oven to 200 degrees. Beat well the eggs and sugar until the mixture gets foamy. Then fold in the flour trying not to loose too much air. 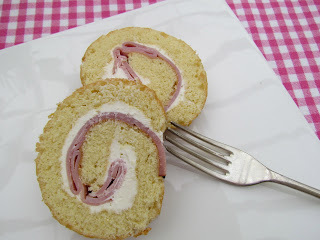 Pour the mixture on a swiss roll tray ( we use a silicon tray, but if you use a normal one then grease it and line it). Bake for 9 minutes. As soon as you take it out of the oven turn it onto a wet kitchen towel and roll it. Let it cool down (rolled with the wet towel) for 15 minutes more or less. When it has cooled down unroll it, spread Philadelphia cheese on top and then put the ham slices on top of the cheese. Roll it again pressing it firmly so that you get rid of any air pockets inside. Cover the cylinder with cling film or foil and let it chill in the fridge until you eat it.